So many shows, and so little time. However, when you do make the time to see a show, you want it to be good. Damn good. 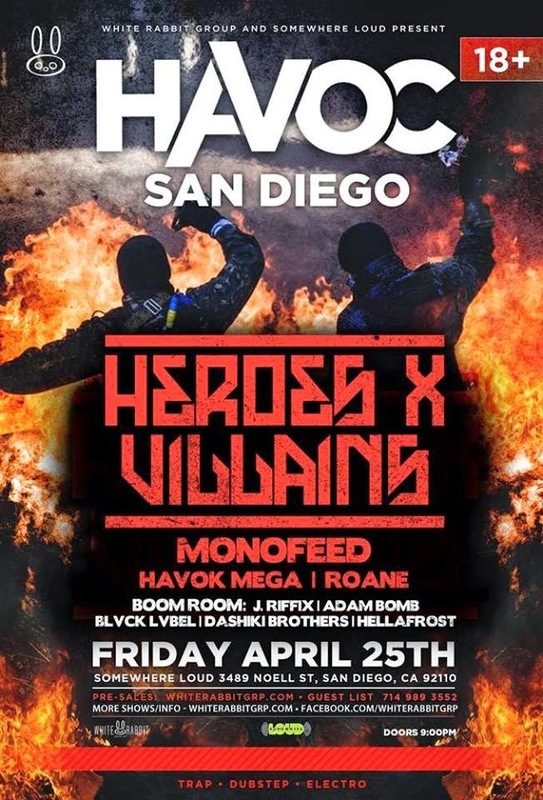 That's why I decided to head down to San Diego to catch MonoFeed and Heroes x Villains at Somewhere Loud, which is produced by Havoc SD. MonoFeed consists of Connor Crowe and Haream Hyun, two SoCal dudes that bring plenty of energy to their shows. They're a staple at the Yost in Santa Ana, as they run the promo team White Rabbit Group, who runs both Havoc OC and Havoc SD. You might have also seen them at Exchange LA or on the main stage at Avalon. Their crazy bass and electro sound is fueled by their desire to make sure you're having a good time on the dance floor. A good time was had, to say the least. Their set had perfect transitions and just the right amount of build ups and drops. I personally am not a fan of too many build ups, and am quite fond of consistent BPMs that allows people to dance without stopping and waiting for the drop. MonoFeed has such a loyal following and fan base, by the look of the crowd from that night, you would have thought you were at a Dillon Francis show or something. These guys should definitely be on your radar, as they are steadily gaining momentum and should soon be a force to reckon with. Opening for ATL trap gods Heroes x Villains definitely helps their case.